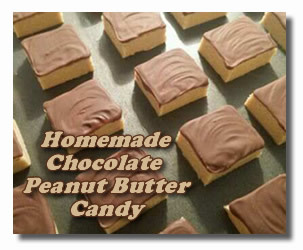 Chocolate peanut butter candy recipes combine the delicious taste of chocolate and peanut butter resulting in sheer and utter bliss. I absolutely love Reese peanut butter cups. That's one of the candies that I've really missed in the years we have lived in Australia doing mission work. That didn't last long. The store only carried them for a short time. That meant that the only time I had the chance to indulge in my favorite chocolate treat was when I visited the States or some kind and generous soul sent me a "care package." You can imagine my delight when a new little shop opened up in our town and they started bringing in a variety of foreign snacks. You guessed it! They began carrying not only Reese's cups, but Hershey's kisses, too. I was in heaven! Well, having said all that, you probably know that I didn't go without my chocolate peanut butter fix all those years. That's where chocolate peanut butter candy recipes come in handy. Here are a few you might want to try. Place the first four ingredients in a large bowl and mix well. Press evenly into a cookie sheet. (A rolling pin will help). Melt the package of chocolate chips and margarine together. Mix well. Spread over peanut butter mixture and allow to cool until dry. Cut into small squares. Scoop peanut butter into large glass or metal bowl and set aside. Combine sugar, corn syrup and water in heavy saucepan. Heat on low until sugar is dissolved, stirring constantly. Boil, stirring constantly, until candy thermometer reads 290 degrees (soft crack stage). Pour over peanut butter and stir until well blended. Spread on well buttered baking sheet and cover with buttered wax paper. Roll out into large rectangle. Cut into small bars while still warm (using knife or pizza cutter). Allow to cool completely. Melt chocolate and paraffin and dip bars into chocolate until covered. Place on wax paper to set. If you prefer, you can use milk chocolate confectionery coating instead of the chocolate and paraffin. Special Note: Some chocolate peanut butter candy recipes call for paraffin wax to be melted with the chocolate. This is to help the chocolate set properly. If you would rather not use paraffin wax, you can substitute the wax with a couple of tablespoons of vegetable shortening.